The Big Bang model predicts that nucleosynthesis, the process by which the elements formed, began approximately 100 seconds after the Big Bang. Driven by the immense temperature and pressure, nuclear fusion reactions converted hydrogen into helium. As space expanded, temperatures dropped below those required to sustain fusion, and as a result nucleosynthesis only lasted for about three minutes. A third of the atomic hydrogen was converted into helium and no elements heavier than lithium could synthesize. Click "Play" above to see how hydrogen and helium nuclei are formed by fusion. Click the play buttons that appear to advance the animation. The graph below represents the abundances of the lightest elements during the first three hours after the Big Bang. Notice that at higher temperatures, only free protons and neutrons existed. 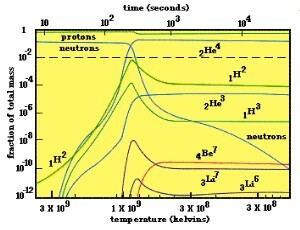 As the universe cooled, deuterium (1H2) was formed, and then helium (2He4), resulting in a decrease in the number of free protons and neutrons. Tiny amounts of beryllium and lithium were produced at cooler temperatures. Nucleosynthesis was finished by t=103 seconds and since then the elemental ratios of the universe have remained constant. Relative abundance of various elements following the Big Bang. We just saw how most of the universe's hydrogen and helium (and trace amounts of lithium and beryllium) was synthesized after the Big Bang. But why were these four extremely light nuclei the only ones to form? The answer is that fusion products involving 5 to 8 nucleons are very unstable, as shown in this animation with beryllium-8 (which falls apart almost immediately after it forms). Click "Play" to see how heavier elements are synthesized. In the early universe, the right conditions were present only long enough to synthesize two elements: hydrogen and helium. 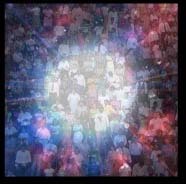 The heavy elements were created later by extended fusion processes inside of stars, and scattered across the universe when the massive stars exploded, a phenomenon known as a supernova.This stellar debris formed the seeds of comets, planets, and even you! The oxygen and carbon in our bodies could only have been formed inside of stars.